Fiji and the Republic of Iraq, on Tuesday, formalised diplomatic relations at a ceremony at the Permanent Mission of Iraq to the United Nations in New York. Peter Thomson, Fji’s permanent representative to the United Nations and his Iraq counterpart, Mohamed Ali Alhakim, signed a joint communiqué establishing diplomatic relations between the two states. 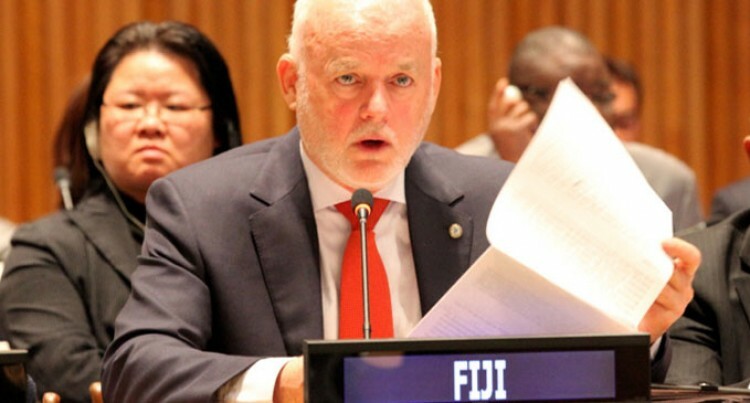 A release from the Fiji office said the communiqué conveyed the agreement of both states for their diplomatic relations to be guided by the principles and norms of the United Nations Charter and International Law, in accordance with the provisions of the Vienna Convention on Diplomatic Relations. The communiqué expresses the desire of both states to promote and strengthen the bonds of friendship and cooperation between their two countries in political, economic, cultural, humanitarian and other fields. Following the formalisation ceremony, the two held talks on areas of common interest between their two countries and potential areas of cooperation at the United Nations and other international forums. Mr Alhakim expressed deep gratitude for Fiji’s provision of the United Nations Guard Unit in Iraq since 2004.